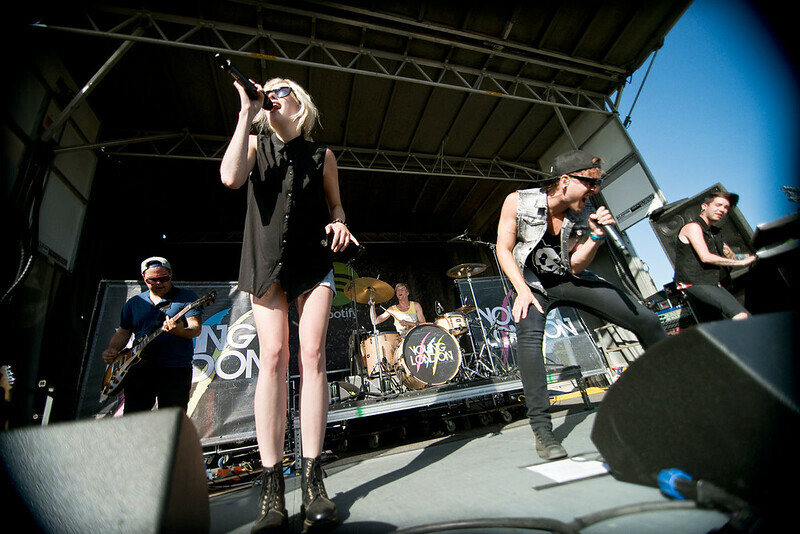 Tonight Alive performs on day 1 of Vans Warped Tour in Pomona, Ca. "The Best Day Ever" is this year's slogan for the annual Vans Warped Tour. Celebrating its 19th year, Warped Tour is a rite of passage for teenagers and for most of us, the kick off to summer. And as always, Warped has a knack for discovering up-and-coming bands on the cusp of breaking out. It happened with Paramore, No Doubt, Katy Perry, Eminem and a pre-Fergie Black Eyed Peas. This year was no different. Pomona last year broke records with nearly 17,000 people attending the Fairgrounds. It ended up being the second largest crowd in Warped Tour history. This year, Pomona hosted the tour for two days straight while also offering a wide-range of lifestyle attractions on-site for a traditionally low ticket price. 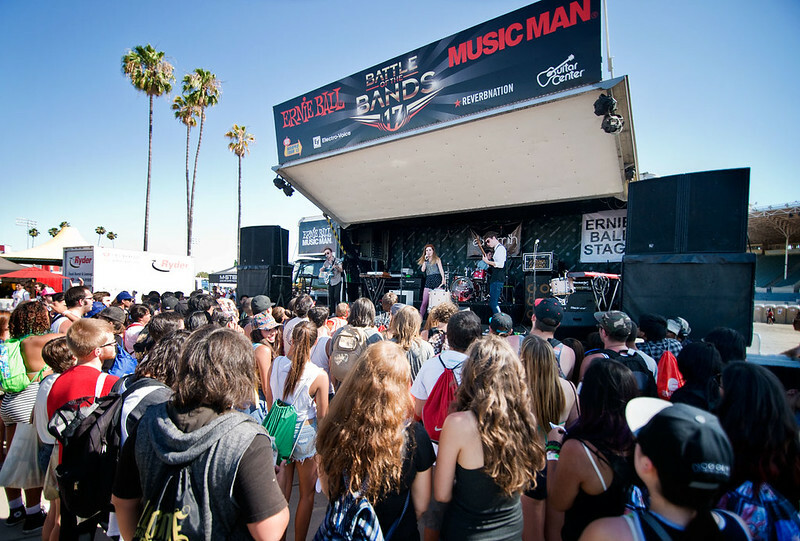 And that's what make Vans Warped Tour attractive to so many sponsors - from American Rag, AP magazine, FUSE, Kia and Spotify. With so many bands to choose from, a mandatory stop at the monstrous and inflatable schedule is the first thing you should do to begin planning your day. Of course, with help from cute volunteers reminding you by parading signs from bands' set times, you'll never miss your favorite band. 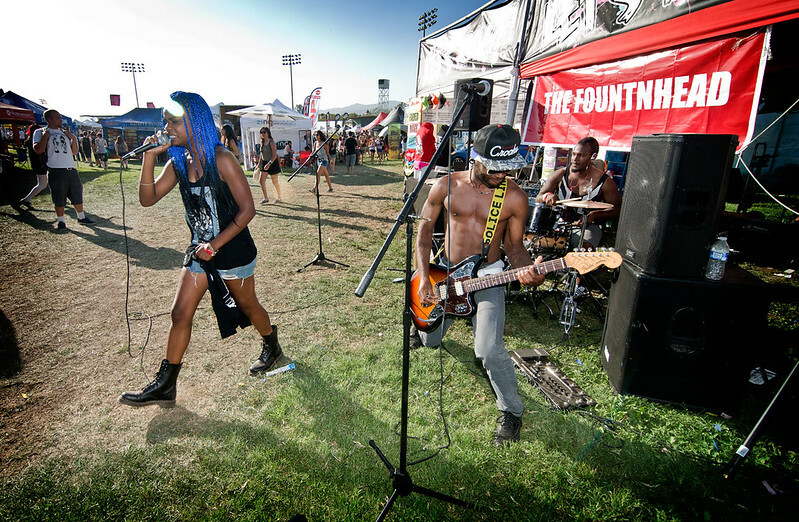 11 stages sprawled the Pomona Fairgrounds, making it a music lovers playground with artists from all genres: rock, punk, pop, hip-hop, folk-punk and reggae. But in the midst of all the testesterone filled lineup, girls managed to shine brightly on this day. Here is our list of bands to watch at this year's Vans Warped Tour. Tonight Alive, on their second tour of duty on Warped, returns with their fierce, high octane, high energy pop-punk staple stateside. Australia's answer for Paramore and We Are The In Crowd, frontwoman Jenna McDougal's poweful vocals can go from 0 to 60 on the stop of a dime; from the electrifying "Breaking an Entering" and "Thank You & Goodnight " to vulnerable and slow "Amelia" Jenna's control is flawless. They've been riding the wave off their critically acclaimed 2011 debut album "What Are You So Scared Of?" Two years later, they're set to release their follow-up this September called "The Other Side," already releasing its first single "The Ocean" to positive reviews. 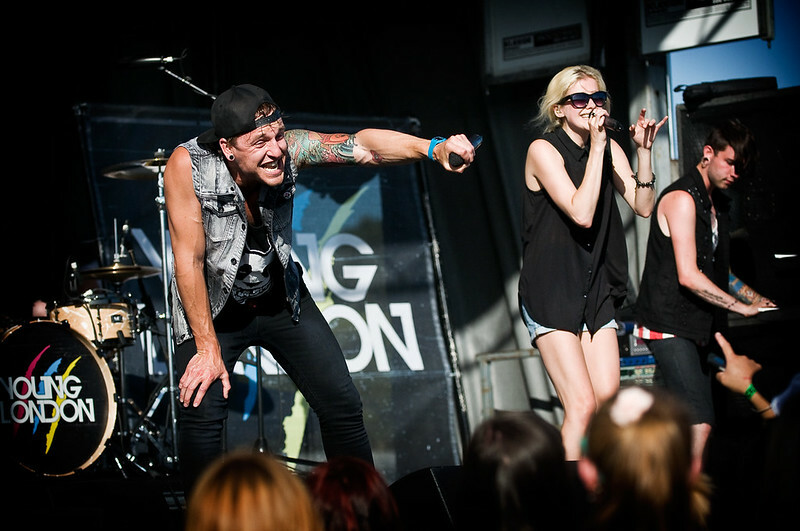 Just like last year, Tonight Alive will be performing for the full 40-date tour. Just like the #Domo Stage, also new this year is the Spotify Stage which showcases new exciting and up and coming EDM artists. Nashville's best kept secret, Five Knives was a welcome surprise. Country they ain't. Who would've guessed that the home of the Grand Ol' Opry had a thriving electric/dance scene. If not, then Five Knives, fronted by Anna Worstell, is breaking down those walls and bringing in some EDM to the GOP. Under Los Angeles' hot afternoon sun, Lamar Baptiste, Zach Hall and Shane Wise donned metalic/relfective masks under their goth-like garments and exploded into their set. Echoing a soundtrack to the post-apocalyptic world of Mad Max, this foursome gives new meaning to sonic landscaping, layering pop, metal, R&B and electro to fuse unique and fresh sounds all their own. By the end of their set, the crowd stretched all the way past the sound booth to the merch tents.They've had a successful year so far, recently coming off tours with Smashing Pumpkins and Die Antwood and they performed a slew of dates at SXSW in March. Last year, I managed to catch Boston's Young London play at Warped Tour. Unfortunatley, it was inside the silent disco tent where you had to listen to their performance via wireless headphones. For those outside the tent passing by, seeing people dance to complete silence surely looked awkward, like mimes during some avant gard New York modern art show. This year, Young London was front and center to display their high energy pop/dance music for all to see; sound turned up to infectious levels that reached out across the Pomona Fairgrounds. Young London's energetic live shows have been garnering word of mouth since they formed in 2011. Their shows? A dance party-like atmosphere that's so infectious you can't help but start to dance.Spearker-climbimg Matt baits the crowd into singing along while Sarah twirls and hops onstage, pumping up the crowd. 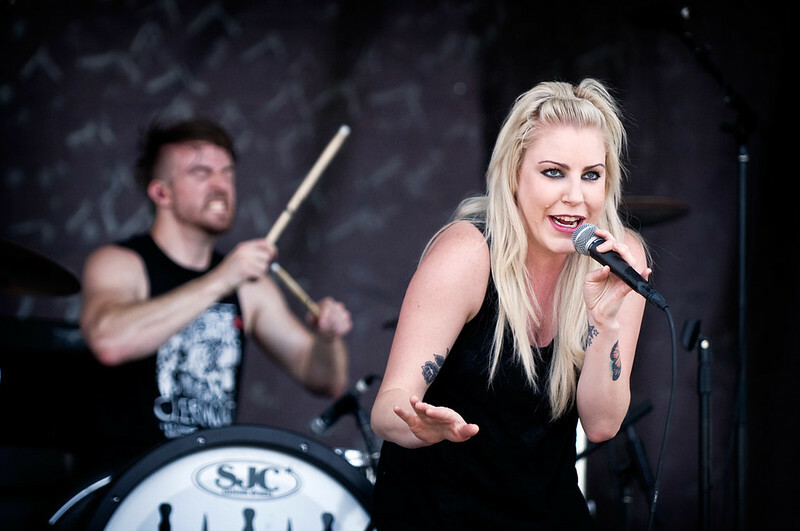 Trading vocals are Matt Rhoades and Sarah Graziani as bright confetti covered skies rained down on the already hot day. Unfortuneatley, it did nothing to cool down their scorching performance and the sweat-drenched crowd. Their hit song, "Let Me Go" a simple reminder of how catchy and memorable their songs are. Add to that their new songs like "I Still Dream" and "Broken" that blend Matt's no-holds barred, potent vocals against the soft and pastel-like voice of Sarah's and you get a ying and yang collaboration that balances both aggressive and soft melodies of what Young London is known for. They’re definitely loud and proud, making no apologies for their take no prisoners attitude. While most artist are trying to change the world through their music, Young London just wants to party while others are trying to do it. There's no harm in that. The heavy hitters, usually performing on the Tilly's Stage boasted New Years Day and New Zealander Gin Wigmore. 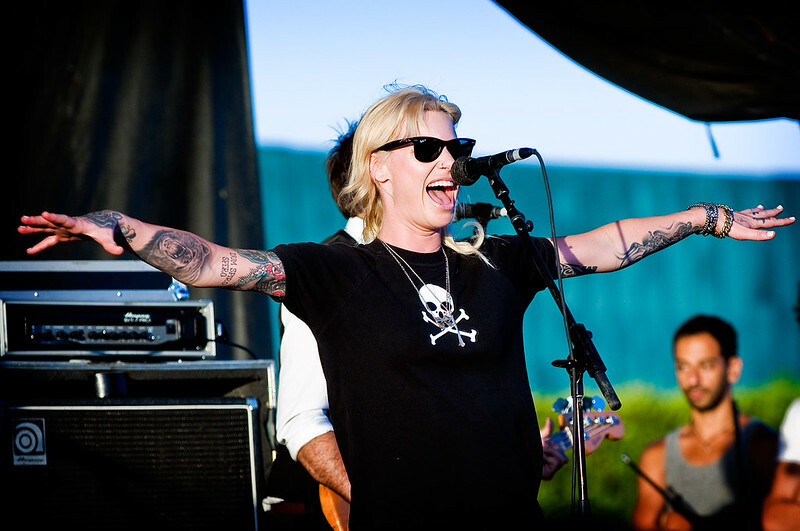 Gin Wigmore, whose a multi-platinum recording artist in her home of New Zealand is a mere no-name here in the States. Well, that's about to change soon. With Gin performing on every single day of this 40-date tour, her name and music will start to generate the buzz she's accustomed to in her homeland. If you haven't heard of Gin Wigmore, you've probably already heard her without even knowing. Her songs "Black Sheep" and "Kill of the NIght" were featured on shows like "Grey's Anatomy," "Revenge," and "Teen Wolf" while "Man Like That" was used in the Heineken commercial that was used during James Bond's "Skyfall" tie-in. Her album Gravel & Wine, released in April, borrows from classic Americana, adding venom into her melodies with touches of Outlaw Country and with a little touch of soul and you've got some dirty, rock 'n hillbilly with attitude. Add to that her hot, pink denim shorts and 'moves like Jagger' and hips don't lie' hip-shaking action and Gin Wigmore is redefining what Outlaw Country looks and sounds like. 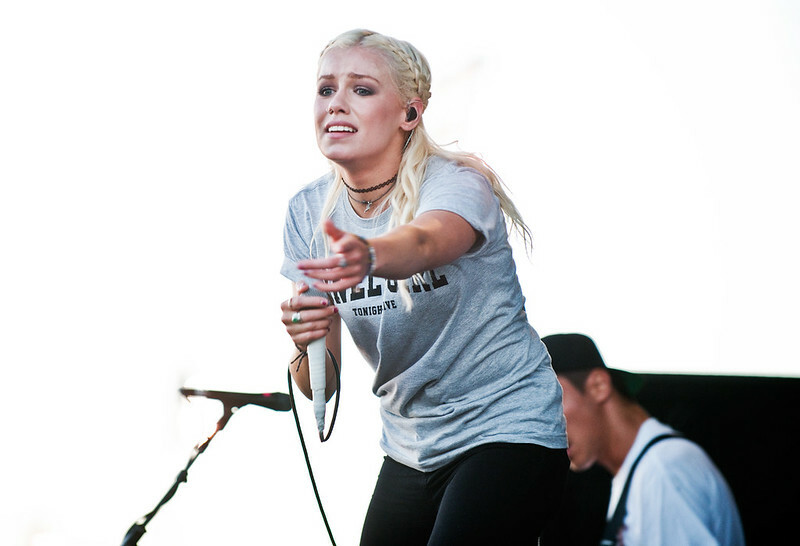 Definitely the rising star at this year's tour, she proved that much at the Warped Tour kick-off party back in March at Club Nokia. Not heavy on punk or metal, it's going to be hard to tell how much of a dent she will make with this much younger crowd until after the tour. But it won't be surprising to see Gin's popularity rise once word of mouth gets out about a great her new album is. 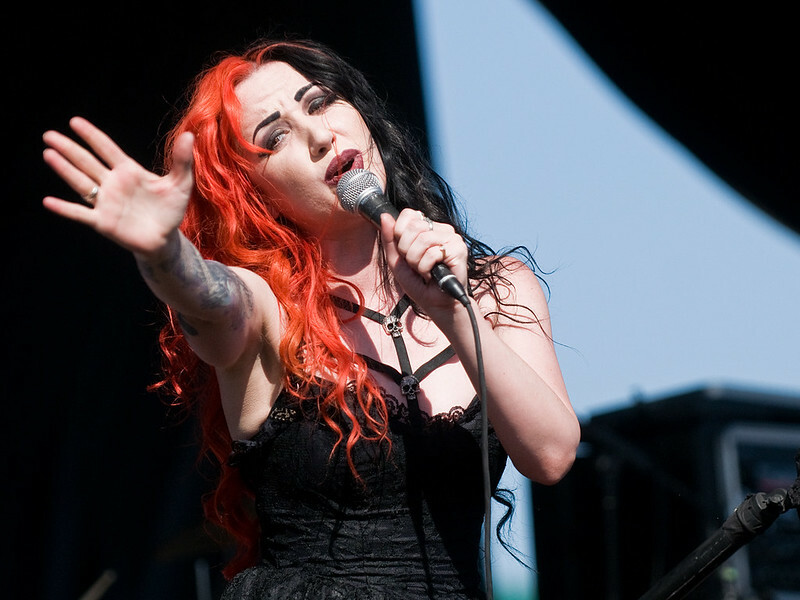 This is the third go around at Warped Tour for local power-pop, five-piece New Years Day. Hailing form Anaheim and fronted by Ashley Costello, NYD is the impending dark cloud in the horizon. Like the calm before the storm, you can see and feel them coming. Only then, do you realize how powerful they are, in sound and energy, when they're right on top of you. No escape. Hunker down and enjoy the ride that is New Years Day. Surviving their set is a badge of honor. The great thing about Warped Tour are the new bands you're likely to discover. The Ernie Ball Stage was the place for that. 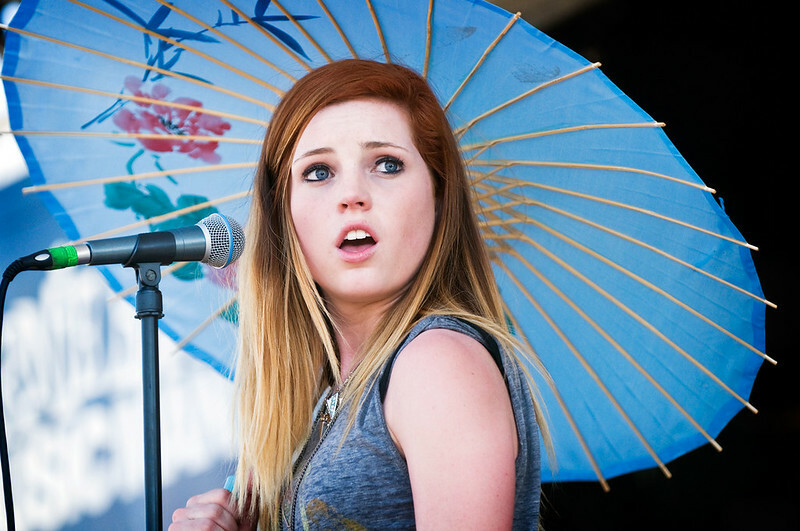 Pasadena-based Echosmith, consists of teen siblings Sydney, Jamie, Noah and Graham. Although they're young, they're practically veterans in the music scene. Busking at a young age at Santa Monica's Third Street Promenade, they got signed with Warner Bros. Records and supported Owl City on their tour last February. Just last week, Warped Tour officially announced that, because of their popularity, Echosmith will stay on the tour for the remaining dates through August. They have a mature sound which isn't surprising when you learn that they grew up in a musical household, their musical influences ranging from Mumford and Sons to Joy Division which probably explains the large turnout when they performed at day one at Pomona. Their songs has a retro, '80s shine to it mixed in with New Wave pop. Just listen to their new single "Come Together," with its vintage sounding, romanticized postcard feel. Their alternative melodies take on a modern twist that makes their songs sound fresh and new. "Cool Kids" is probably their darkest tune, layering catchy yet moody melodies with Sydney barely singing above a whisper. And working the crowd like pros, they threw in Modern English's "I Melt With You" and got the crowd singing along towards the end of their set. And with their debut album coming out later this year on top of Alternative Press magazine just naming Echosmith as one of the "Top 100 Bands To Look Out for in 2013" the sky is the limit for these siblings. The Ernie Ball Battle of the Bands is now in its 17th year and has proven to be a breeding ground for North America's best unsigned talent. The winner for this year's contest was The Material from Southern California. Going to a Material show is like buying a one way ticket on the high seas on one of those boats on Discovery's "Deadliest Catch"; serene, milky pond one second in songs like "Bottles" then gale-force winds and tsunami waves the next as heard on "Life Vest" and "Gasoline." At first notice of The Material, you marvel at the powerful vocals of lead singer Colleen D'Agostino balancing above crashing, aggressive sounds. Colleen, along with shipmates , Jon Moreaux, Roi Elam, Kevin Pintado and Jordan Meckley drives this boat named "The Material," maneuvering into the impending doom, taking 60 foot rogue waves head on. If they can't find a way through, they'll make one. One way or another, you're stuck for the ride of your life. Like a carefully choreographed dance with the waves, The Material knows that without risk, there is no winning. The darlings of the indie music scene , The Material has found themselves on many influential lists like Purevolume's Top 20 Unsigned Bands and have been featured in Alternative Press Magazine, MTV, Music Connection and MF Magazine. And with their latest album Everything I Want To Say released in April, 2013 is looking to be a breakout year for this So-Cal band. The Acoustic Basement Tent is a stark contrast to what was going on outside. While outside, the blaring sounds of metal and punk rock controlled the fairgrounds, inside the Acoustic Basement Stage, it was a different story. 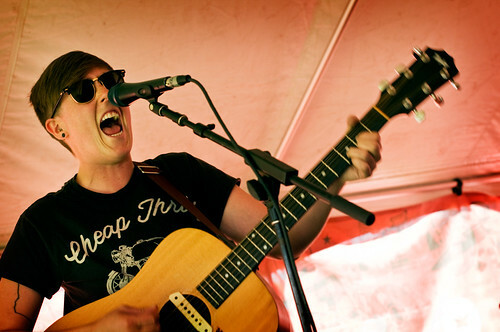 Featuring established and up-and-coming singer/songwriters, this day showcased Allison Weiss. Self described as folk-infused powerpop, Brooklyn-based Allison infectious melodies are only highlighted by her catchy lyrics. “I want a one way love” she sings on One Way Love, “ The kinds that won’t give up. I want to hope, one trust, one need, one lust.” And it’s those types of lyrics that Allison has a way of showing the bright side of heartbreak in her newest album Say What You Mean. She’ll end her Warped Tour this Wednesday at Washington D.C. then then head on tour with Slingshot Dakota for the rest of July until she heads across the pond for her European tour. The Girlz Garage Tent is a place the focuses on the ladies. This day, the teens of A+ Dropouts performed under the pink shaded tent, which was also the home of Keep A Breast where you could also find I ‘heart’ boobies bracelets and merchandise. As their official bio boasts, "A+ Dropouts members spend their days filling their report card with A+'s but when the school bell rings, they rock the stage with their high energy shows." Not a stretch since their sound does reflect living the life as teens on the sunny shores of the OC - fun and carefree as they sing of love and heartbreak that only kids at their age can feel because every emotion is new for them. And that's why Boy Games, the latest EP from A+ Dropouts, fronted by 15 year-old Cheska Zaide, sounds refreshing and not forced. For each stop on the tour, a local stage featured bands selected through regional “battle of the bands” process punched through by votes. This year, I happened to stop during a performance from MadnMac, two sisters from Anaheim. Writing their own songs, Madison Marie (15) and Mackenzie Paige’s (18) unique sound of mixing elements of pop, rock, R&B, reggae and a little bit of country made them stand out at this year’s festival. And with a confident stage presence, MadnMack proved why these two have been making music since before they were teens, having already released two albums with their most recent Everyone's Watching released earlier this year with standout singles "That's My City" and "Forever in a Day." Check it out! One of the highlights of the day came from a band that didn’t play on any stage. Between the beer garden and the Spotify Stage, a band from Atlanta called FountNhead had one of THE best performances of the day. With a booth set up next to the main stage, FountNhead had surprise pop-up performances, racing in a few songs, against time, before the next band started to play above them. 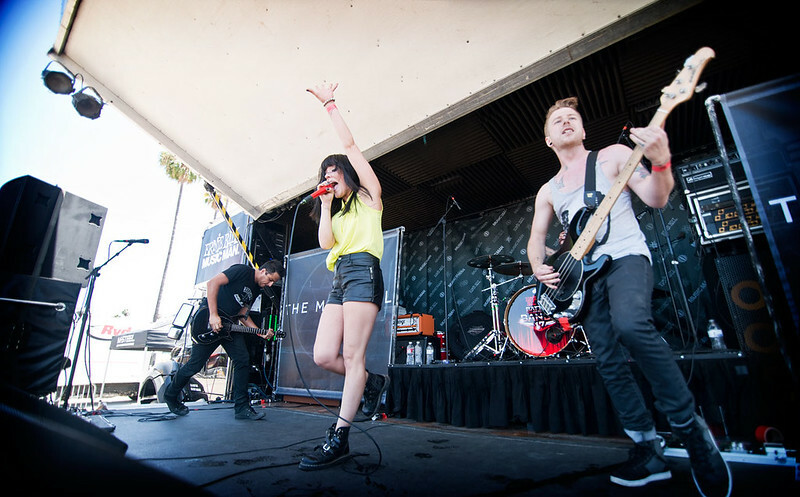 Click HERE to check out the rest of our photos from Warped Tour Pomona. Against the Machine. Their song “As A Skunk” is an energized, fighting the machine anthem follwed by fist pumping, hard rockin’ beats peaked the interest of those walking by; enough so that a sizable crowd stopped to listen. I came back for seconds and thirds, knowing I’ll get to hear more songs each time I stopped by. Don’t miss these guys! Fountnhead will be playing the entire Warped Tour. Other notable bands we wished we caught were Lost In Atlantis since I was stuck in line and when they played first at 11:30. Hopefully I'll get a chance to watch them soon. 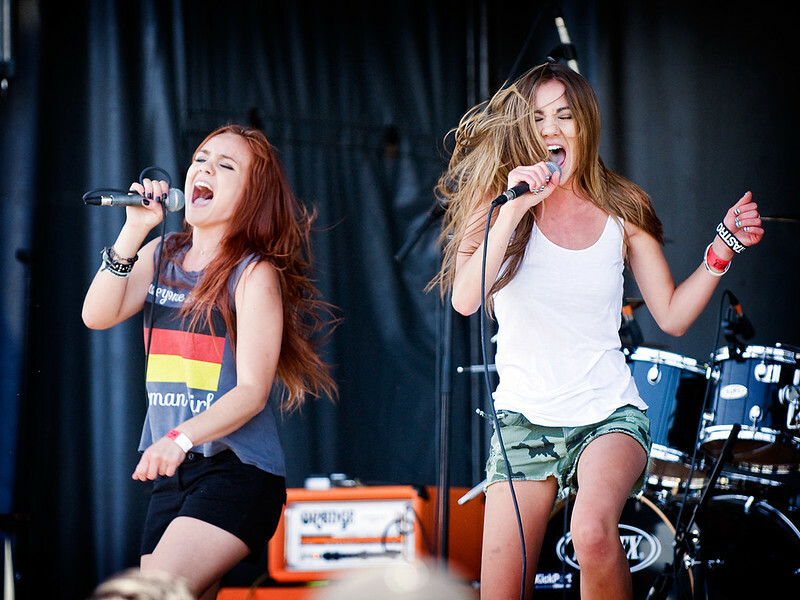 Vans Warped Tour continues to have a strong contingency of women-fronted bands. This year they seemed to top themselves yet again with some favorites such as New Years Day and Tonight Alive and some new up-and-coming bands like Gin Wigmore, Echosmith, Five Knives and Fountnhead. Warped Tour continues through August. Be sure to catch one of them, if not all, if they make it to your town.